Note: This article may be triggering. For immediate emotional support, the 24-hour Indian Residential Schools Crisis Line is available toll-free at 1-866-925-4419. SASKATOON - The thunderclouds had scattered by morning when the sounds of footsteps, engines and drumbeats converged in Saskatchewan last week. Thousands of Indigenous residential school survivors, their relatives and people from different walks of life gathered in Saskatoon, traveling from all four directions. 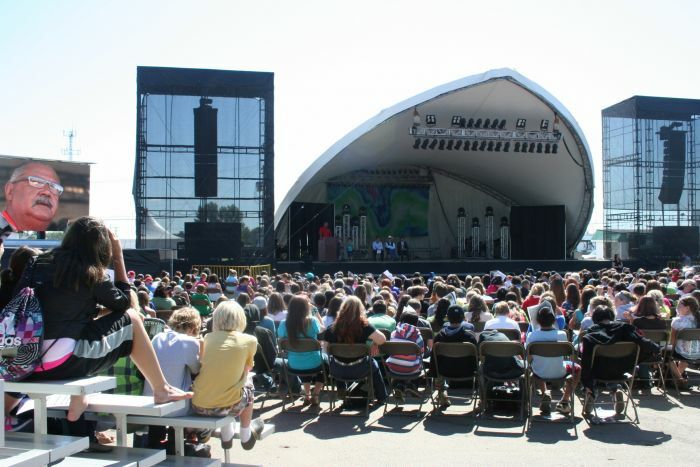 From June 21 to 24, laughter, tears, songs and stories were in the air at Prairieland Park, where the Truth and Reconciliation Commission of Canada held its fourth national event. Survivors who gave statements about their experiences and participants who witnessed the event reiterated the importance of documenting and understanding the truth of residential school history. But on the reconciliation of that history, consensus was not even on the horizon. Half of the estimated number of living residential school survivors in Saskatchewan, the registration was the largest to date. Countless others also attended the event and more than 5,000 viewers from countries around the world tuned in to the live webcast. Friday’s ‘Education Day’ also had the highest participation on record. Nearly 2,000 grades 7 and 8 students from public, Catholic and First Nations schools attended the national event to hear from survivors and learn about residential school history. Over 150,000 First Nations, Métis and Inuit children attended residential schools operated by the federal government and various churches from the late 1800s until the 1990s. Their languages and cultural practices were forbidden. Many suffered physical, sexual and emotional abuse. The event in Saskatchewan marked an important midway point in the commission’s activities, said Littlechild. Statement-gathering, research and outreach events are ongoing across the country, but the commission must also hold seven national events, according to the mandate established by the 2007 Indian Residential Schools Settlement Agreement. Winnipeg, Inuvik and Halifax hosted events during the first half of the commission’s five-year mandate, with Saskatoon marking the mid-point before Quebec, Vancouver and Alberta. “We shift our focus now from an emphasis on truth to an emphasis on reconciliation,” said Littlechild. But whose emphasis will be in focus remains to be seen. Representatives of various churches and the federal government, parties to the Settlement Agreement along with survivors of more than 130 residential schools, have made apologies and often speak of reconciliation in the present tense. References are often made to “a new chapter” in Canadian history, placing the “sad chapter” of residential schools mentioned in Prime Minister Stephen Harper’s 2008 statement of apology firmly in the past. Many residential school survivors have publicly expressed skepticism, anger and doubt about reconciliation. But another critical perspective on the issue of reconciliation, however, is found within the commission itself, in Lead Commissioner Justice Murray Sinclair. At a regional event in Victoria this past April, Justice Sinclair said that the role of the commission is to begin a conversation with Canada about what reconciliation means. The commission fully expects that reconciliation would take at least as long as the 130 years during which residential schools operated. The issue is about more than the abuse many suffered, he added. “This is a conversation about an attitude about a whole race of people,” said Justice Sinclair, echoing a view that many survivors have expressed about the continuity of attitudes, policies and legislation from the residential schools and the founding of Canada through to today. Doubt about reconciliation with Canada has also come from members of the commission’s advisory Indian Residential School Survivors Committee. A member of the Survivors Committee from Saskatchewan, Eugene Arcand played a key role throughout the Saskatoon event. He seemed to be everywhere over the course of the four days, addressing the students at Education Day while accompanied onstage by his granddaughters, speaking at the opening and closing ceremonies, and greeting just about everyone. Arcand is affectionately referred to by many as any number of variations of the nickname ‘Bird.’ Like Big Bird, he towers over almost everyone else, but many in Saskatchewan look up to him for more than just his height. Other residential school survivors at the event would tell each other if the Bird was coming their way and wait to shake his hand, meet his family or thank him for the work that he has done. Arcand spoke of his own experiences with truth and reconciliation at a Circle of Reconciliation panel on Friday afternoon. Residential school survivors were seated in a semi-circle alongside representatives of the parties to the Indian Residential Schools Settlement Agreement. The Métis Nation was also represented onstage, although its members were largely excluded from the agreement. “It’s been difficult to talk out of one side of my mouth about truth and reconciliation when in another side of my heart I have very strong feelings about the actions of the federal government,” said Arcand, specifically mentioning the Canadian government’s halt to funding for the Aboriginal Healing Foundation, mandated by the Settlement Agreement. “Actions speak louder than words,” he said. When he explained that leaders – not only those of the federal government, but also First Nations leaders – must be evaluated not by what they say but by the legacy they leave behind, the room erupted in applause, whistles and cheers. Arcand was the first of ten people to speak during the Circle of Reconciliation. Seated directly to his left was former Assembly of First Nations (AFN) Grand Chief Phil Fontaine. Directly across from him was current AFN Grand Chief Shawn Atleo. John Duncan, Minister of Aboriginal Affairs and Northern Development Canada (AANDC, formerly INAC), was also present onstage. In his own presentation about reconciliation, Duncan followed the path other institutional representatives have sometimes taken at commission events and told personal stories. He spoke of the dislocation of his home community in a coal-mining region in BC’s interior. He told of his childhood confusion when his mother told him that his Squamish best friend Richard from the neighbouring Capilano reserve might not be returning to public school in North Vancouver for grade 5. Duncan had a ten-minute opportunity to respond to direct challenges from survivors regarding federal funding cuts to the Aboriginal Healing Foundation and other organizations, the exclusion of the Métis from the agreement, and other relevant actions taken by the Canadian government. He did not take it. No one participating in the Circle of Reconciliation mentioned that the court-mandated Indian Residential Schools Settlement Agreement that ended the largest class-action lawsuit in Canadian history is only an agreement until it is broken. If any party to the agreement – such as the Government of Canada, for example – does not fulfill its obligations, representatives of the original plaintiffs – residential school survivors – can return to court. Many residential school survivors not participating in the panel sessions or in the event in any official capacity were also critical of reconciliation, both in their statements to the commission and in conversations offstage. Paul Sylvester was enjoying his pancakes on Saturday morning, sitting in the sun at the edge of a long table under the food tent in Diefenbaker Park. The free breakfast was served before the long 12-hour day ahead at the national event across the street. Finishing his pancakes, Sylvester set up an impromptu smoking section while speaking about the land near his community of Turnor Lake. A Dene residential school survivor, he also shared his thoughts about the event and reconciliation. Sylvester gave statements to the commission earlier this year, at regional hearings in both Prince Albert and La Ronge, in northern Saskatchewan. Sylvester takes strength from the memory of his mother, he said. He is the eighth of 23 children, although eleven passed away, most as infants, from malnutrition. Despite all of the loss and everything she went through, his mother always told him to stand tall and keep his head up. He has been retired for a decade, but Sylvester continues to be active in grassroots political activity in his own territory and beyond. In spite of his own experience in the residential school system, he believes in the importance of education. He is currently working with the Office of the Treaty Commissioner in Treaty 10 territory on a ‘Teaching Treaties in the Classroom’ project, developing curriculum for elementary and high school courses. “There’s not too much curriculum in the classroom about the lifestyle of the Dene People, of our survival on the land, or the history,” said Sylvester. The First Nations history currently taught in the province is largely focused on southern Saskatchewan, he said, and it has not been easy to advocate for revisions. But the passion that Sylvester has pursued throughout his life is getting to know Dene territory directly on the land. As a young boy before attending residential school and as a youth after he returned home, Sylvester accompanied his father along his trapline, taking notes and drawing maps. He prides himself on continuing to live off the land, tracking and hunting animals, working the trapline, and using local resources to make his own canoes and snowshoes. And to deal with the trauma of his residential school experience, Sylvester turned to the land he has known since childhood. Fred Sasakamoose also found some healing in walking on the land. He led a three-and-a-half-day Indian Residential School Survivor Walk from the residential school he attended as a child to the national event in Saskatoon. Sasakamoose, 78, now has more than 40 grandchildren and 40 great-grandchildren. He took five of his grandchildren with him along the walk, which began at the place where St. Michael’s residential school once stood, in Duck Lake, Saskatchewan. The building is no longer there. He had to use old stones and memories from over 60 years ago to attempt to answer his grandchildren’s questions about the location of the building and the makeshift hockey rink where he learned the skills that would later propel him to a brief professional career in the NHL. “I thought I would hear screaming and crying, because that’s all I knew,” said Sasakamoose of his visit to the grounds. He was sent to residential school in 1940 at the age of six, along with his eight-year-old brother whose abuse he witnessed before being himself sexually abused at the school. He gave his statement to the commission at a regional hearing earlier this year. But he still carries the memory of five children from his reserve who were sent to St. Michael’s and never came back. They are buried somewhere on the grounds that he visited, he said. “Every footstep that I’ve made, it was for the people that never told their story, that are gone,” said Sasakamoose. As the event came to a close on Sunday evening, the sky began to cloud over as people prepared for the journey back to their families, communities and territories. Many will gather again at the commission’s remaining national events in Quebec next spring, Vancouver in the fall of 2013, and later in Alberta. Others will turn to their families, communities, or back to the land for healing. The discussion about reconciliation will continue. The truth-telling will continue. And the memory of the thousands of children who never lived to tell their stories remains ever-present. As people left the event and began to make their way home, in all four directions, the raindrops began to fall. Sandra Cuffe is a Vancouver-based journalist. Heartbreaking this truth is. Accountability through truth telling = healing. I am happy to find this article and have read it. This is really great article! I’ll definitely be back for updates. This is very interesting to me because it involved about student, I am also a student. I love reading and I am always searching for informative information like this.